San Antonio, Texas tangler Allyn Johnson shares her fun Bartom tangle with us and it’s her second on the site. Be sure to check out her Contacted tangle too. “I love round, bubbly forms in tangles, and I came up with this one day. I named it Bartom because the patterns remind me of both a barbell and models of an atomic compound. Vary “bubble” size and line length for different effects. Use different patterns inside the bubbles. For a variation, connect more than one bubble together (see Step 6). 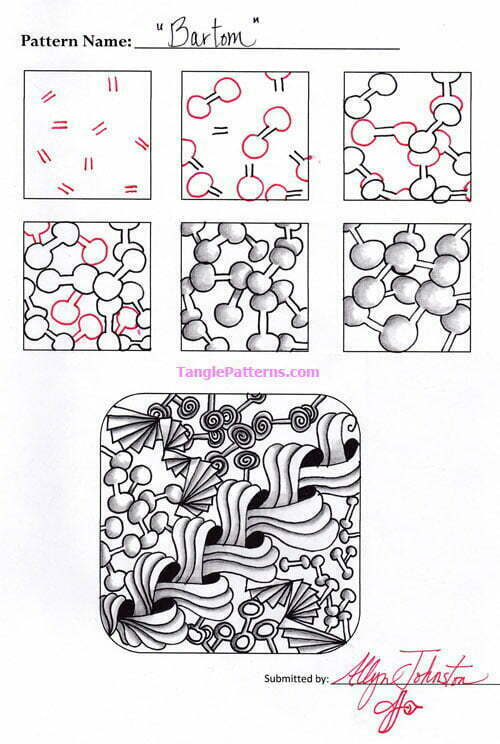 Allyn illustrates the step-by-step instructions for drawing Bartom below where she features it with variations in a ZIA with Sayantika Ray’s Organic and Helen Williams’s Steps tangles. And I agree with Allyn: “so versatile” with fills, color, scale … even organization if you need want it! I love this tangle – I’m using it for a filler on what is to be the ocean that I have a “tangled” dolphin jumping into. Fun stuff! This looks like fun. I will try it soon, thanks Allyn. I like it! I’m going to try it tonight during my nightly tangle time. Thanks! !